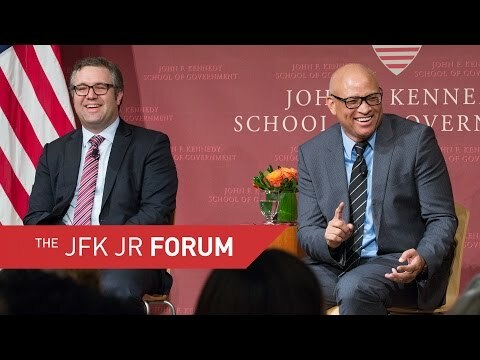 Director of the Shorenstein Center Nicco Mele (left) laughs at a retort by comedian Larry Wilmore during their talk at the Harvard Kennedy School. “I do find it ironic that we elect a reality show star as president, and you invite a fake journalist to give the Theodore H. White lecture on it,” said Wilmore. So when did Larry Wilmore know Donald Trump could win the presidency? The moment came during the first Republican debate, the Emmy-winning writer, comedian, and producer said. Wilmore presented his thoughts, leavened with humor, as he delivered the Theodore H. White Lecture on Press and Politics on Tuesday night at the Shorenstein Center on Media, Politics and Public Policy at the Harvard Kennedy School. The evening event also saw the presentation of the David Nyhan Prize for Political Journalism to Nancy Kaffer. A columnist and member of the editorial board of the Detroit Free Press, Kaffer has written extensively about that city’s mortgage problems and the Flint water crisis, among other issues. After a moving introduction by Nicco Mele, director of the Shorenstein Center, Wilmore took the stage. Speaking softly, almost quizzically, the political satirist focused on “keeping it 100,” or 100 percent real, as he used to say during the tenure of “The Nightly Show with Larry Wilmore,” which ran on Comedy Central from January 2015 through August 2016. Given the timing, one week after the presidential election, Trump’s unexpected victory was the main focus of the talk, but Wilmore also addressed the roles of media and comedy, the legacy of President Obama, and his own show. This involved some minor theatrics — Wilmore jumped from chair to chair as he alternated between interviewer and host — as he mixed jokes with perceptive, and pained, comments on the state of our nation. When Trump took Wisconsin, “that phone basically burst into flames,” he concluded, applauding himself, in the role of the interviewer, for the timely reference to failed technology. From misogynist comments to mocking a disabled reporter, “everything Donald Trump did should have disqualified him,” Wilmore said, in a theme he returned to repeatedly. After asking himself if the president-elect ran a racist campaign, he answered in the affirmative. Looking forward, Wilmore wrestled with the issues of reconciliation and of hope. For himself, he split the difference, expressing dismay while seeking a path ahead. While Trump's wall may never come to fruition, Assistant Professor Roberto Gonzales sees canceling the Deferred Action for Childhood Arrivals as the easiest way for the incoming president to appease his immigration hard-liners.